Randy (Worncog) and I attended this event last year when it was on the Biltmore estate. This year it's closer to Hendersonville in what seems to be a nice location - it's an hour from my home, so easy peasy for me. This is a cool event for overlanding (4x4) vehicles and motorcycles, albeit more geared to the dual-sport and 4x4 realm, it's still a blast. Camping, eating, riding, driving, all that other good stuff in and around some cool roads. 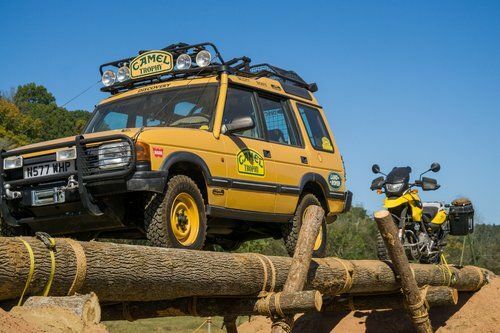 It isn't cheap for 4x4s but for the motocamping and the overall ambiance and education about places, people and exploring our world, it's a bargain. And you can meet some of the big names in world travel like Ted Simon and others. And see or purchase awesome movies by these travelers or chat with them about their travels. I think the overall price for moto folks is around $100 for the weekend including moto camping and access to all the classes and events. Then an extra moto only banquet on Saturday for $50 that includes food and drink and a chance to win really good tchotchkies. I snagged a really nice Sena for my efforts to sit and eat. Sorry I don't have any cool shots of Randy on the moto course or the camping and rides on the back roads of the Blue Ridge (awesome too!). Cellphone took a crap on the final day of the event. Still trying to get those pics off the card. But here's one on the off road course of the static display. I'm doing my 4x4 this time around, just to experience the event from the other side as I'm setting up my off road rig (and trying to convince my significant other that a Textile Hilton is just as good as a real Hilton if she'll come ), but I'm adding in the moto banquet if I can. Guess we'll discuss this at the Wolf this weekend! It is a great event. I did the Full Monty last year with the rider instruction and the dinner. Not as lucky as Mike with the tchotchkies, but the rider course has paid big dividends with my big bike off piste riding. They have a great variety of vendors and the overland rigs that they have there are pretty awesome.